This prime time of the year brings stunning weather as 'blossom by blossom the spring begins" (Swinburne, again) and we are reminded anew how lovely Palm Beach can be. Strolling down Worth Avenue, poking into the little bougainvillea-laced Via's, wandering into the wonderful variety of shops and eateries, sitting in the quiet serenity of the parks and gardens that are in full bloom, watching the ocean's twinkling waves...Palm Beach surely is paradise! 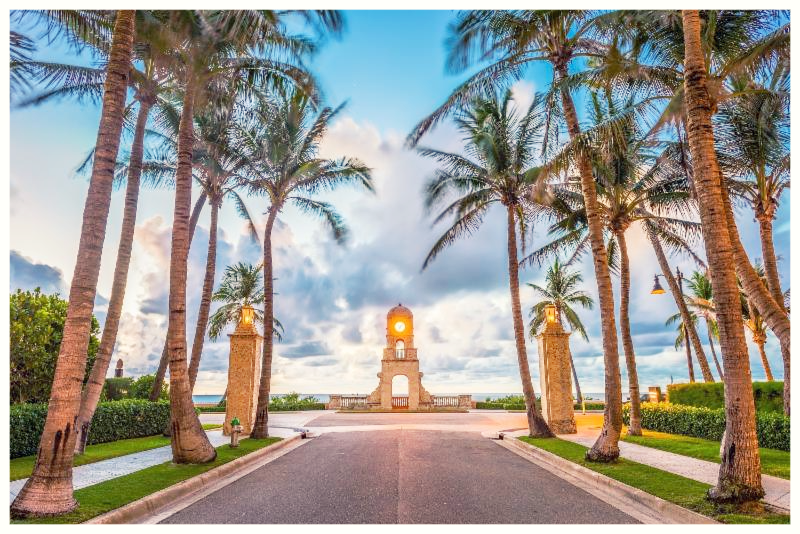 Whether we live or visit here, for the first time or for many years, spring in Palm Beach is like no other place...it is magical. 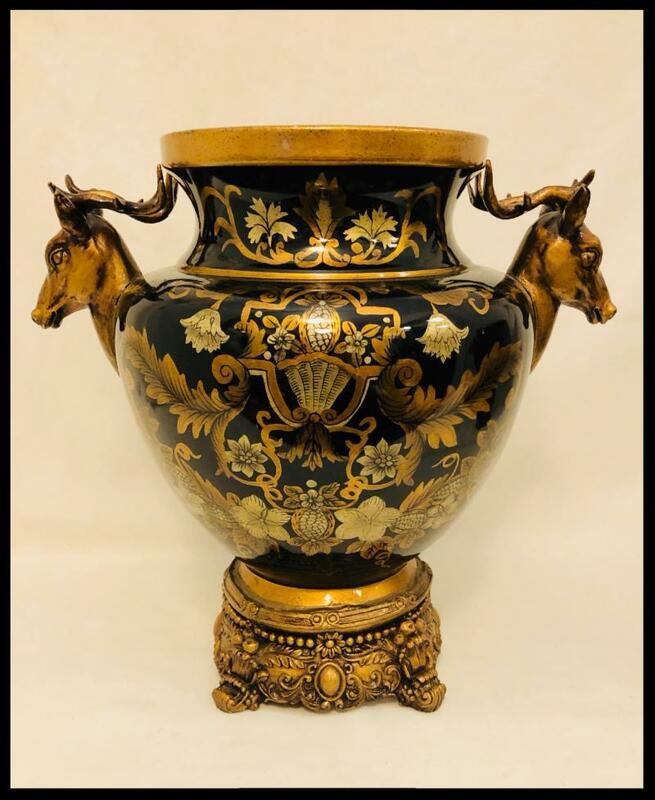 We hope that Classic Collections is part of the magic for you as you explore the treasures that we offer! 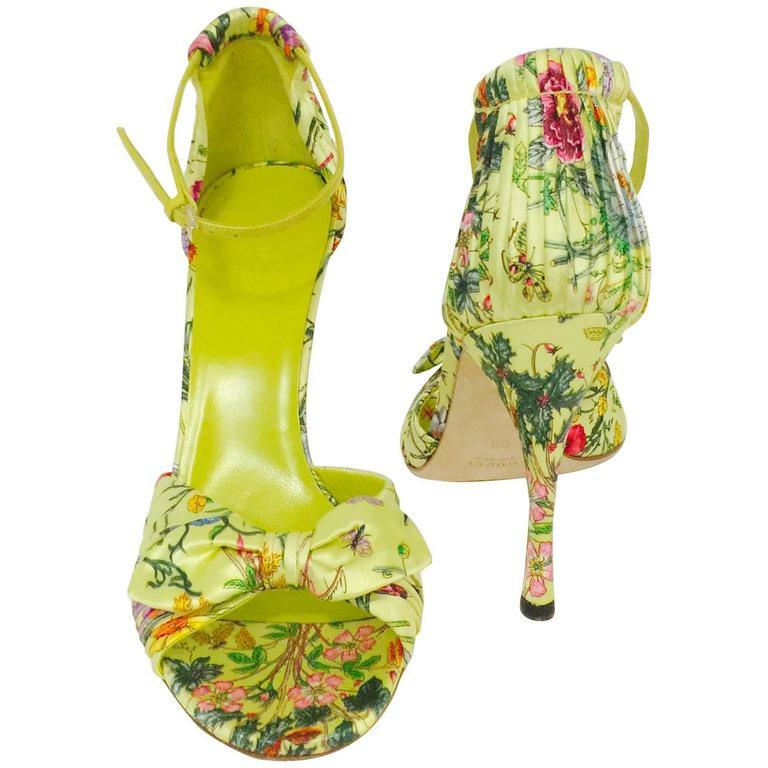 With "Spring Cleaning" in full force, we are delighted to have greatly augmented our stock of luxury clothing, handbags, shoes, costume jewelry, accessories, formal wear and fine jewelry. New merchandise is arriving every day and much of it is brand new! 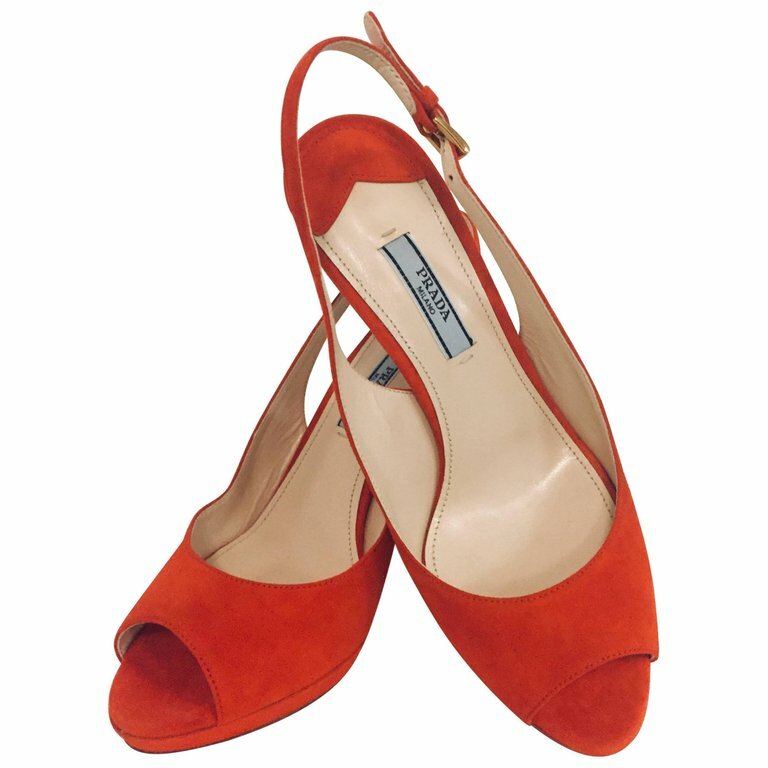 So, whether you are in the mood for new Hermes handbags, flirty Manalo sandals, enchanting Chanel ensemble, Jimmy Choo shoes, flippy Cavalli skirts or you just want to be surprised, come on in! It's time for a fresh start! 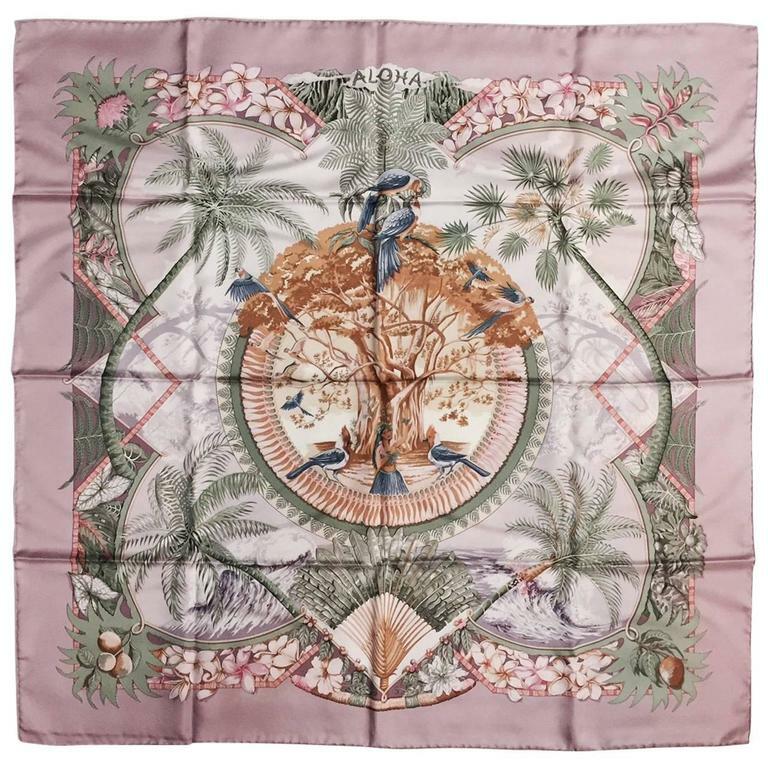 We are pleased to present a simply stunning collection of Hermes scarves to accent all of your spring outfits! 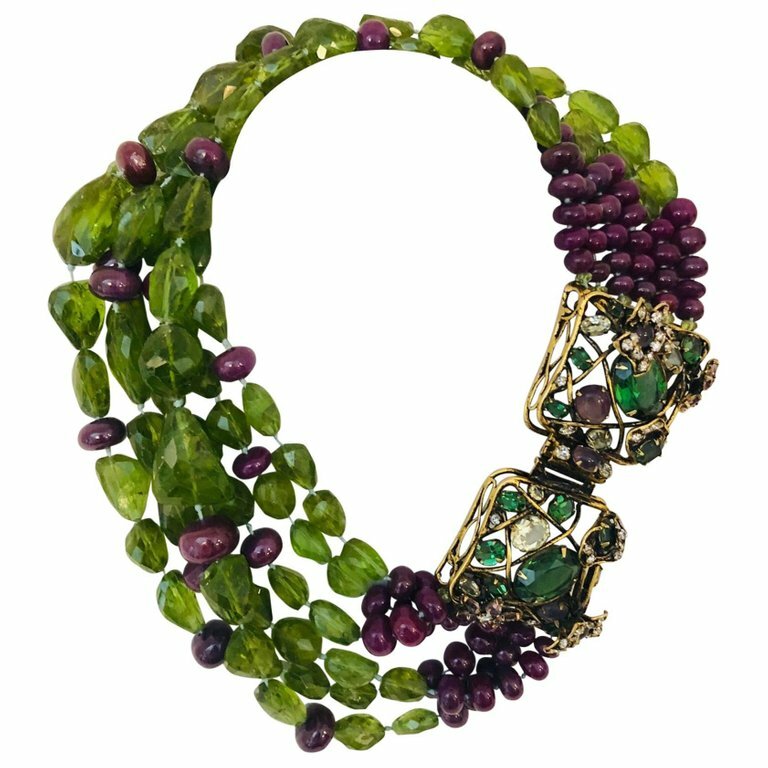 Oh yes, those April breezes will flutter through these treasures and show the world how chic and classical you are with those brilliant designs wrapped around your neck, adorning your purses or--even possibly-covering your hair should there be an April shower or two (think Queen Elizabeth, Sharon Stone, Lady Gaga)! 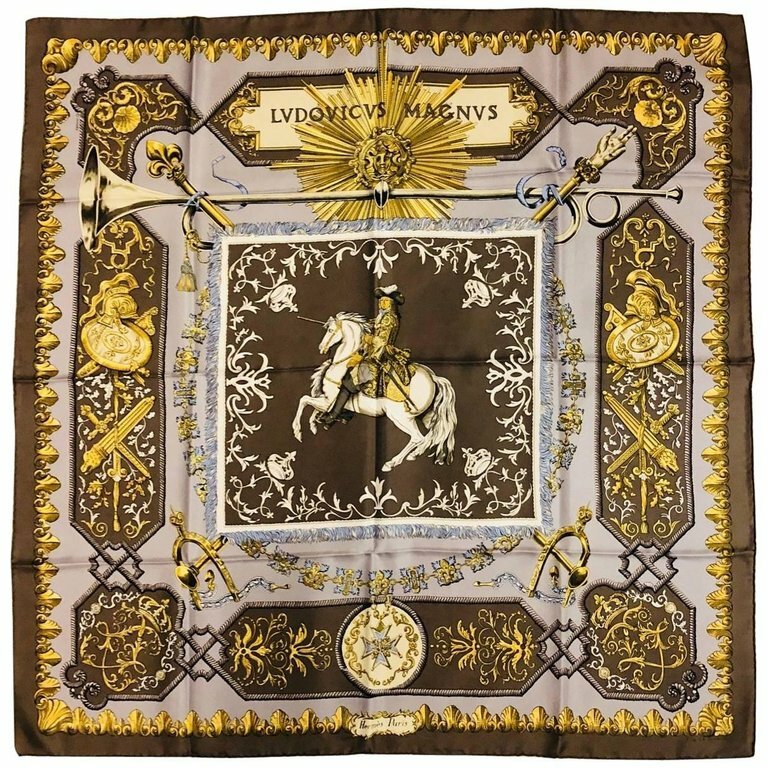 As all fashionistas worth their American Express cards may know, the Hermes scarf was introduced by the House of Hermes in 1937 and it was a print of white-wigged ladies playing a popular period game and it was named "Jeu des Omnibus et Dames Blanches". 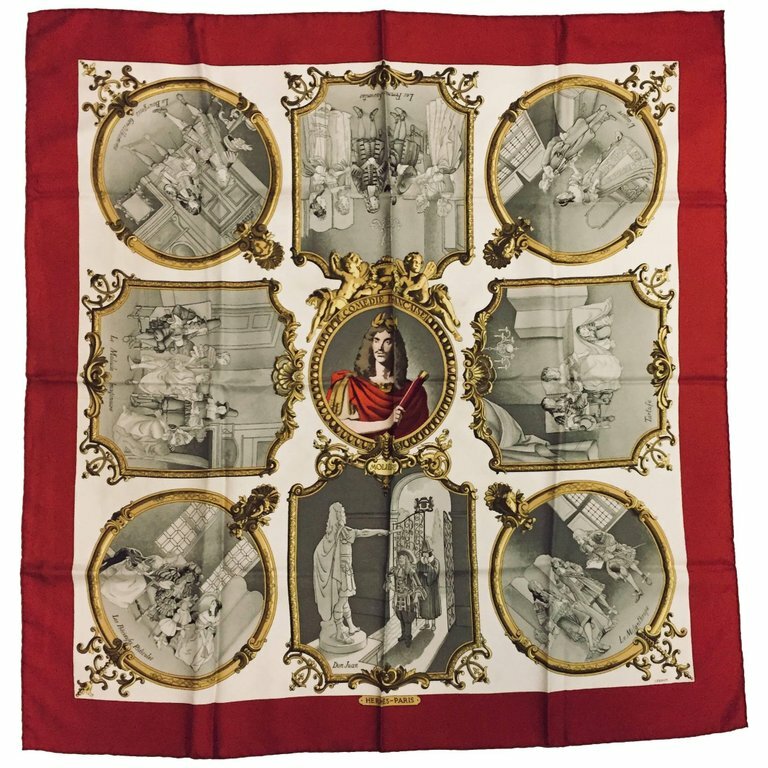 "Jeu des Omnibus et Dames Blanches"
When scarf production first began, the company was 100 years old and a dedicated scarf factory was established in Lyon, France. 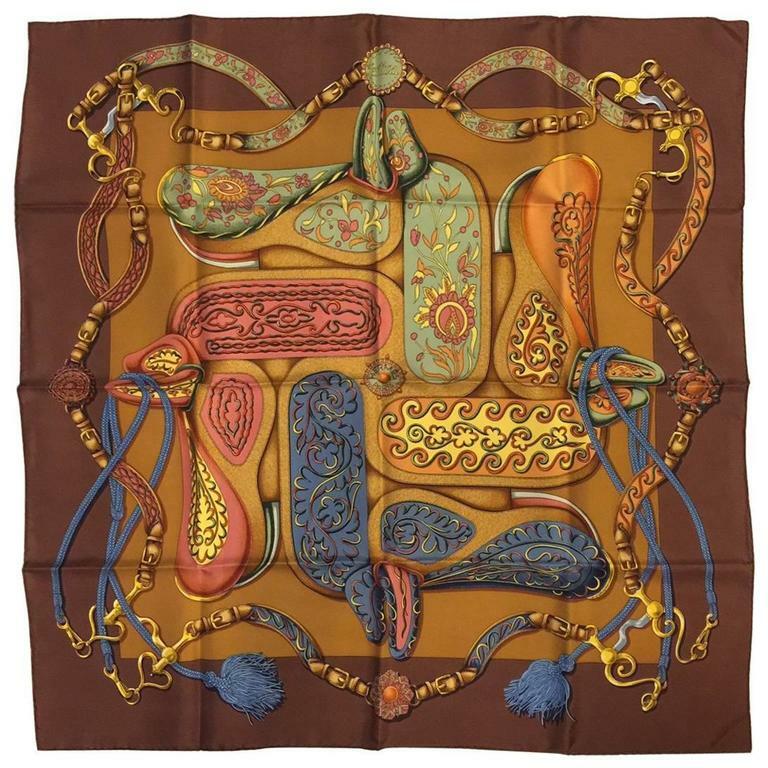 Hermes controlled the production of its scarves from beginning to end, purchasing raw Chinese silk, spinning it into yarn and then weaving it into a finished fabric that was twice as strong and heavy as most scarves were available at that time. 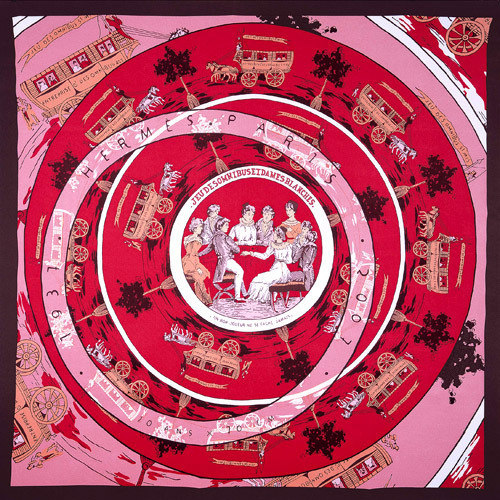 Over the years, Hermes scarf designers spent years creating new patterns that are individually screen-printed and since 1937 over 2,000 unique designs have been created. 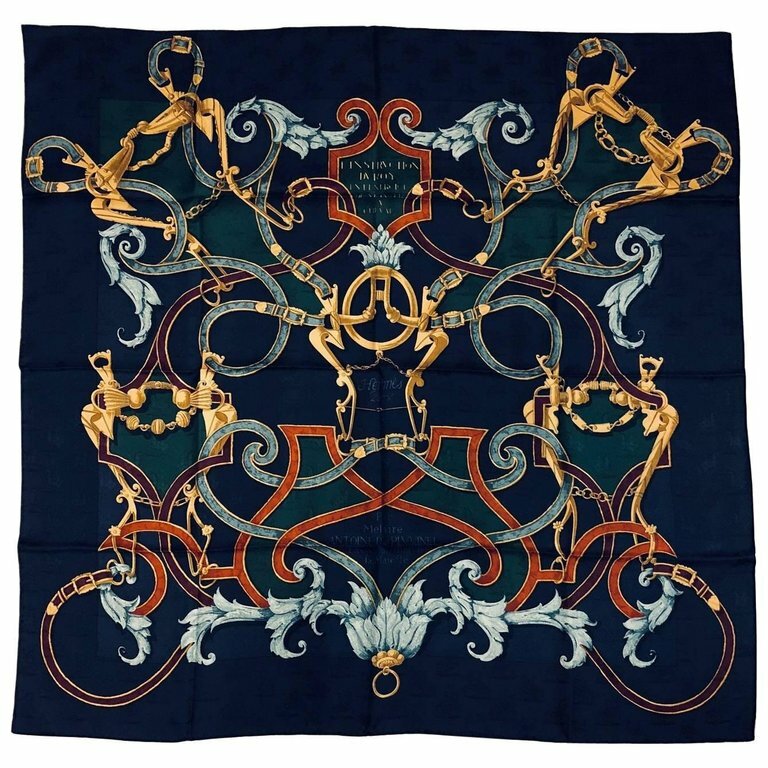 Choosing from over 70,000 different colors, the scarves weigh 65 grams and are woven from the silk of 250 mulberry moth cocoons. 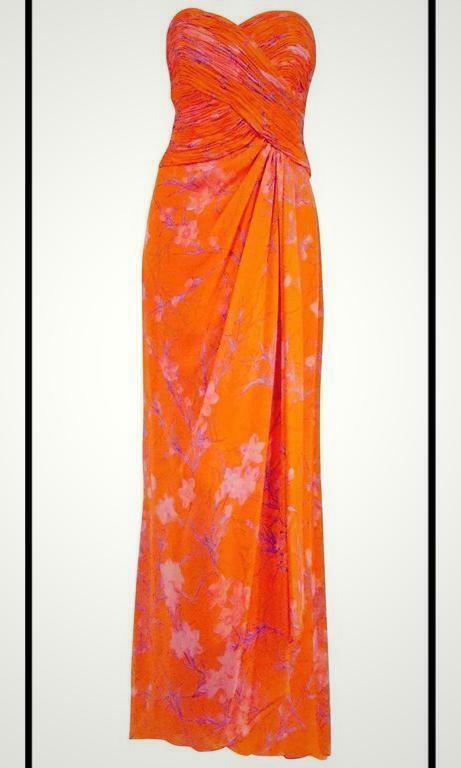 The average size of the scarves measure 90 cm x 90 cm and all of the hems are hand-stitched. 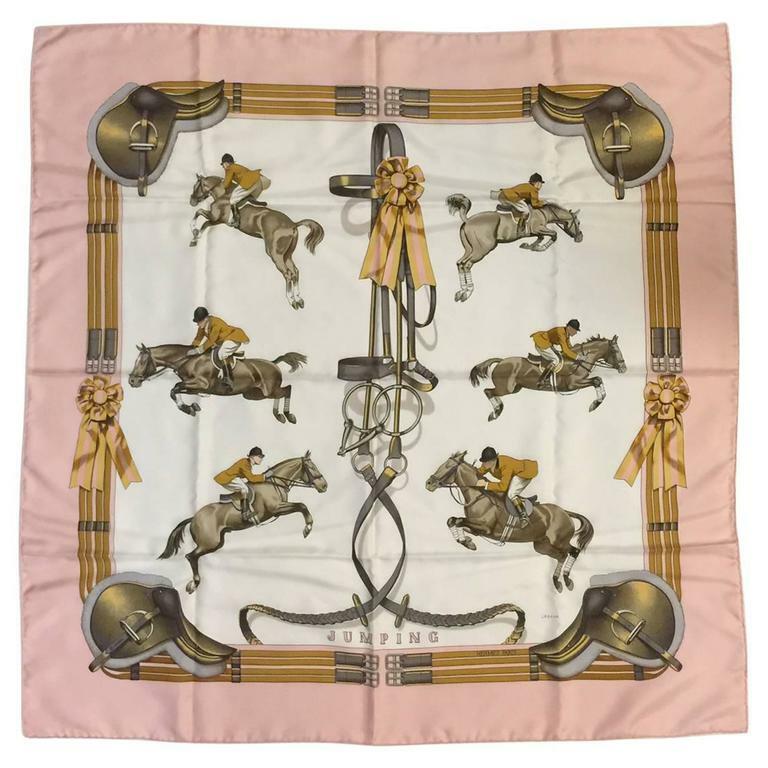 While scarf themes are vast, the horse motif is especially popular and famous. 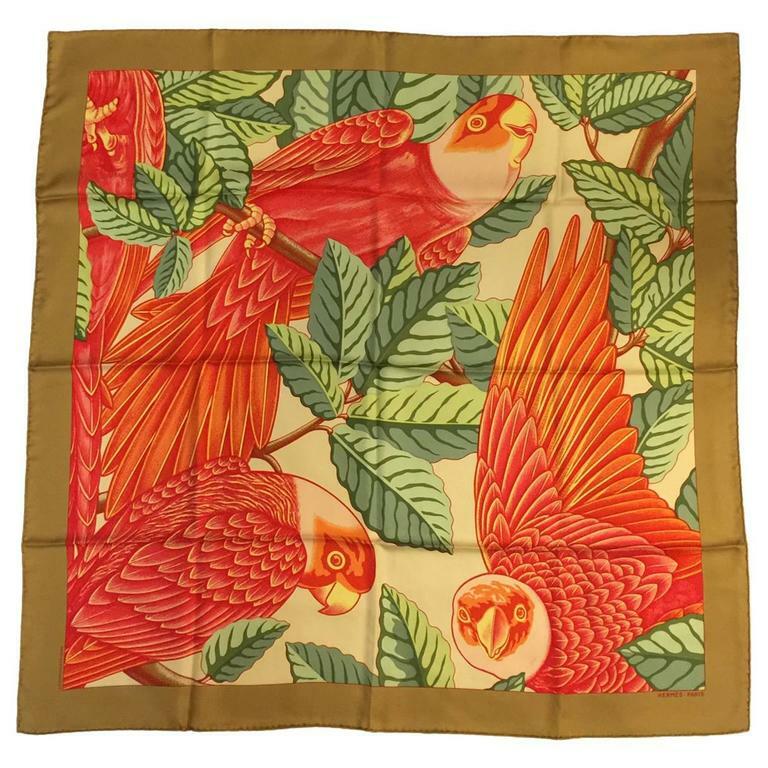 However, two silk collections are released each year, along with some reprints of limited editions and older designs. 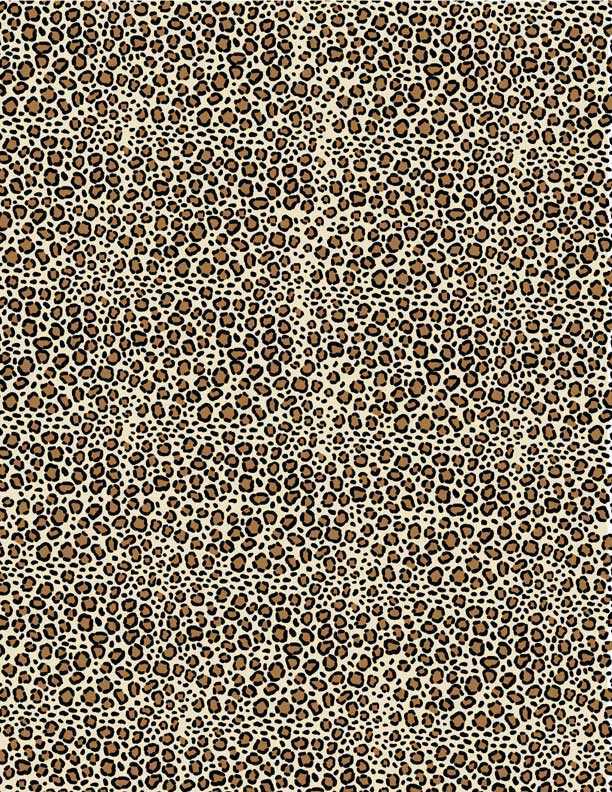 Two collections are released per year in a cashmere and silk blend. 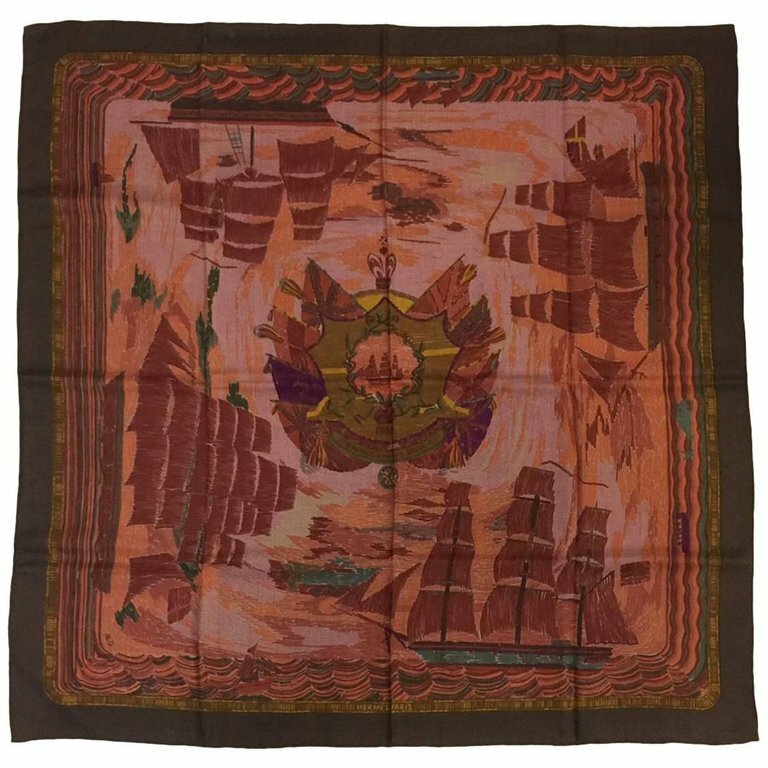 Cashmere and Silk "Marine Naive"
It is reported that an Hermes scarf is sold somewhere in the world EVERY 20 SECONDS...Better hurry in to make up your quota!!!! YOU HAD ME AT SUNGLASSES! Who is that hiding behind those fabulous shades? It could be you! If you need to update your sunglass inventory, now is the time to come into Classic Collections and take a gander at our outrageous selection! 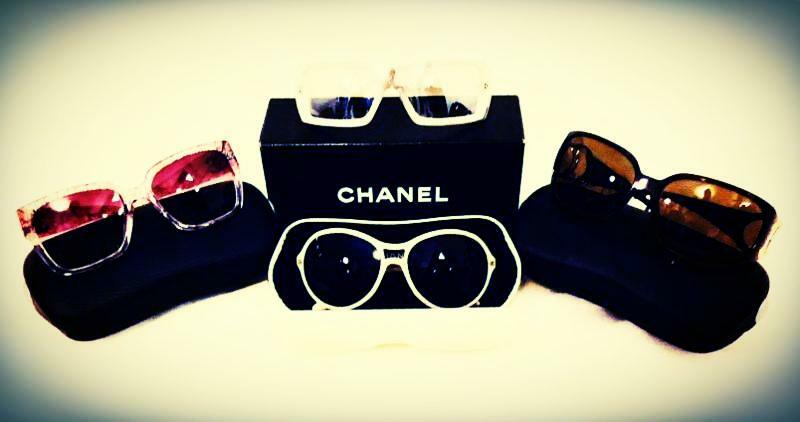 Cartier, Lanvin, Prada, Cavelli, Dior, Tom Ford, Gucci, Valentino, Dolce & Gabbana, Marc Jacobs, Bvlgari, Louis Vuitton, Versace, Ralph Lauren, Stella McCartney and of course Chanel are some of the brands that we are stocking right now! 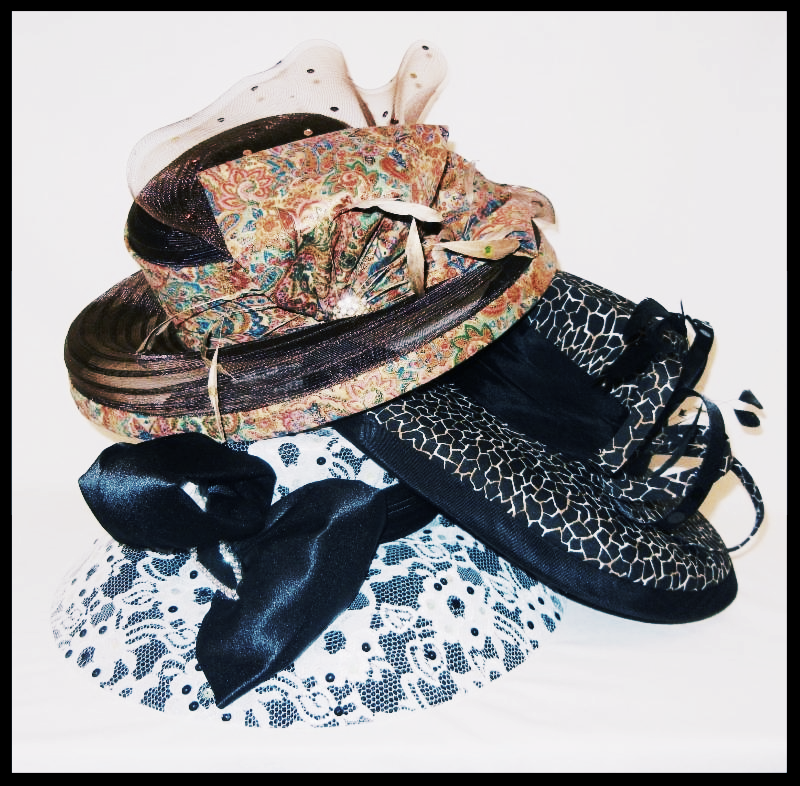 Oh, yes, we can celebrate this marvelous season with all of the fashionable hats that we carry at Classic Collections! Whether you need a hat for Polo, Derby parties, Ladies Luncheons, Holidays or just because you look FAB in hats, come on in and see our remarkable selection. We carry hats from Judith Marx, Eric Javits, Philip Treacy, Eugina Kim, Pucci, Frank Olive, Ralph Lauren, Armani, Helen Kaminski and Patricia Underwood. 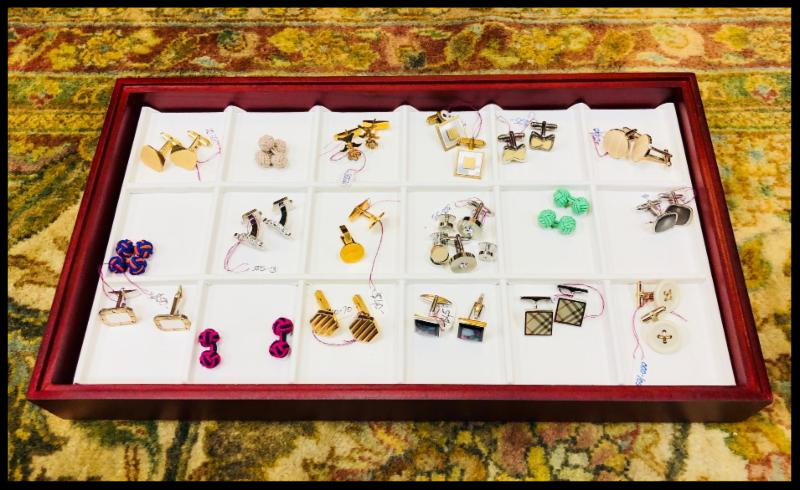 From past couture designers we feature delightful, hard to find confections from Adolfo, Chanel, Galanos and others. Or, as Margo Nickel once said, "Whenever you wear your hat, your day will be special"! Spring savings are available for our gentlemen clients too! Between 30 - 50% off discounts are being offered on much of our clothing, shoes, ties, formal wear, scarves, pocket squares, sweaters, jackets and coats. We have some lovely luggage and briefcases such as S. T. Dupont, Hartmann, Cole Hahn, and others. Some Hermes, Valentino and Gucci belts are on sale for 20% off. S.T. 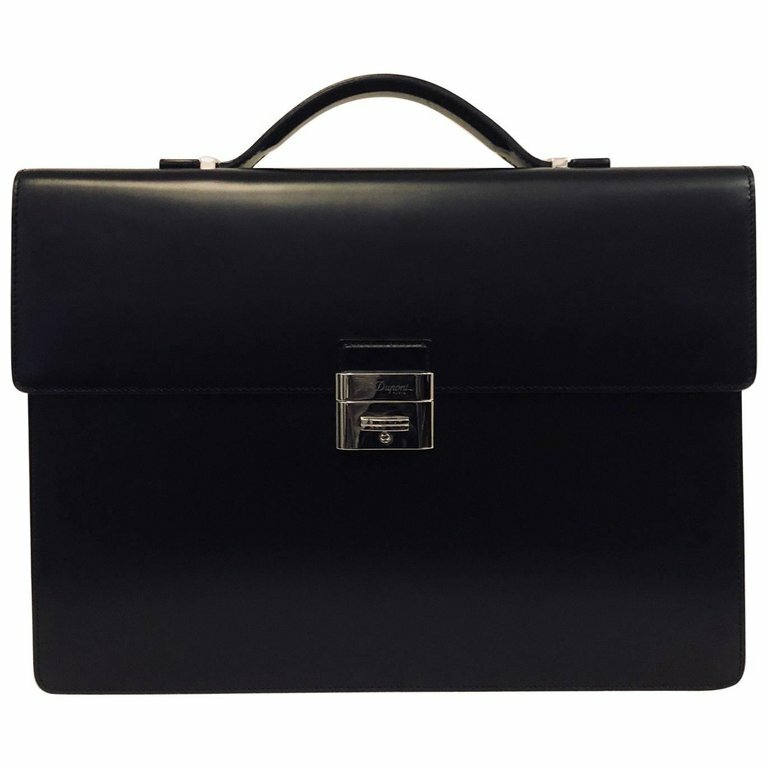 Dupont Leather Briefcase - NEW! 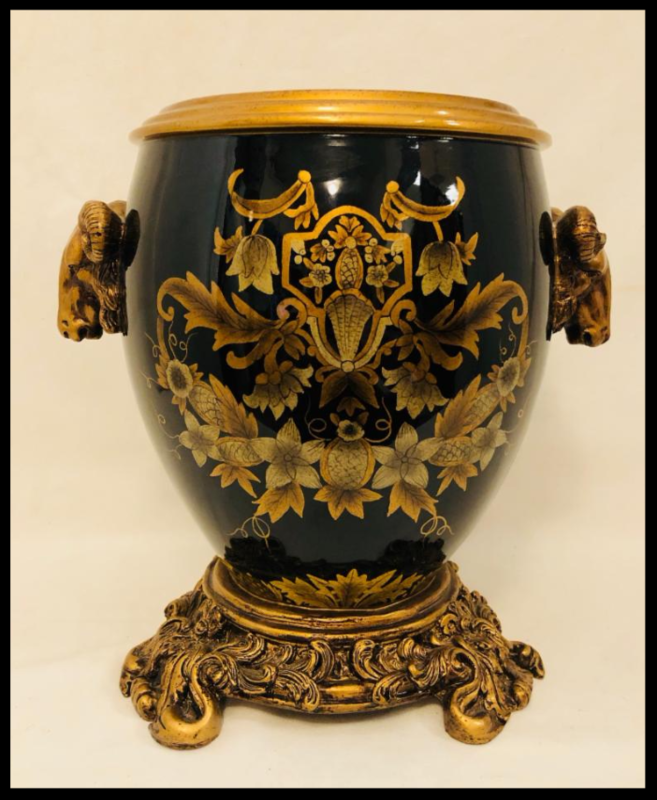 Home accessories such as bar ware, art, crystal, cigar accessories, picture frames, needle point pillows, and small miscellaneous furniture is currently available. Silver platters, serving dishes and other fine home accessories such as bronze and ceramic sculptures and decor are here for your shopping pleasure. 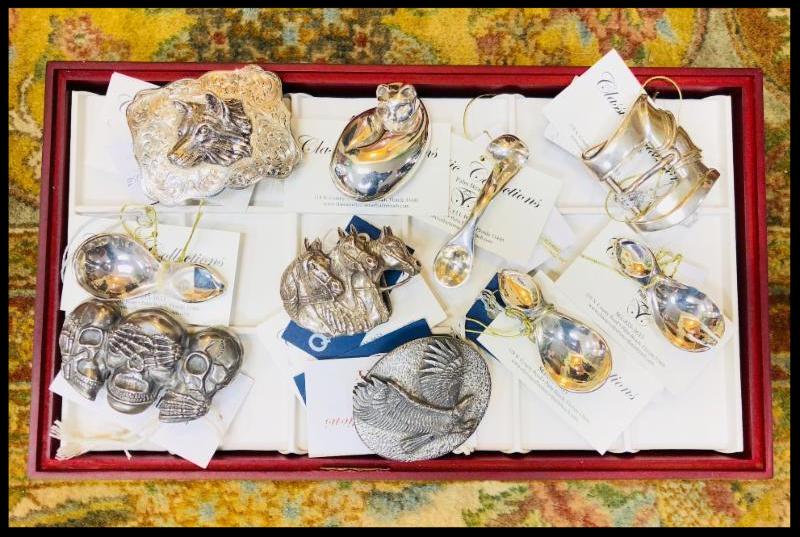 Jay Stongwater trinket boxes and frames, sterling silver compote dishes, Tiffany sterling carving knife and other silver utensils, sterling candlesticks, creamer and sugar, salt cellar, bottle opener and picture frames are also available. An assortment of walking canes and unusual men's hats are also available. Men's jewelry on sale includes cufflinks, bracelets, rings and necklaces. 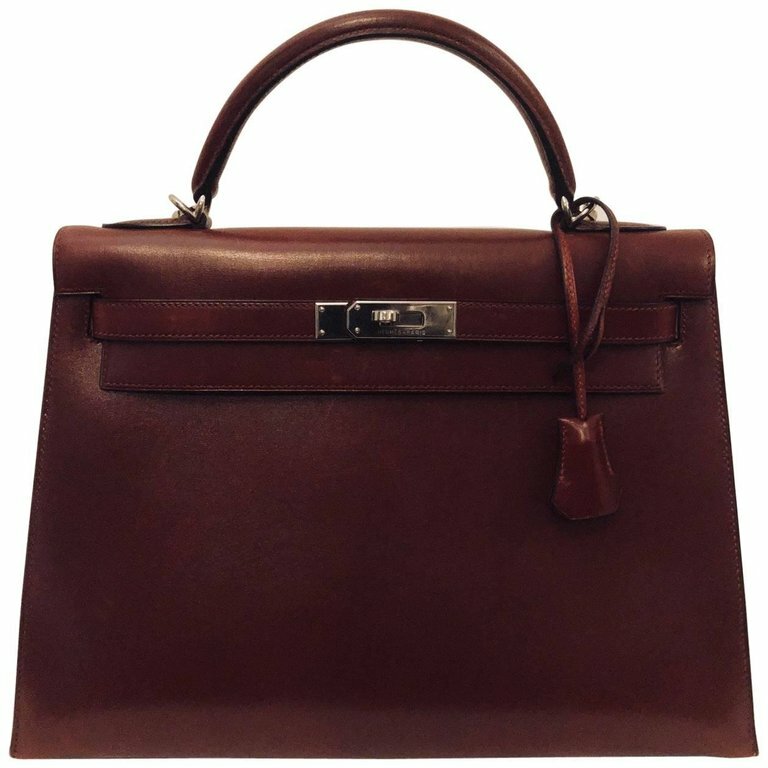 We also have wallets by Cartier, Louis Vuitton and S.T. Dupont. Belt buckles include an 18 karat gold buckle, elephant pewter buckle and 2 Hermes alligator belt straps in brown and black. By the way, we are sad to announce that due to our lease expiring, we will be closing Gentry on April 30, 2018. We have had a wonderful time working with our gentlemen clients and customers and will miss the lovely ladies who come in for home accessories. It has been a pleasure serving our customers and getting to know our consignors and we thank you for your business. 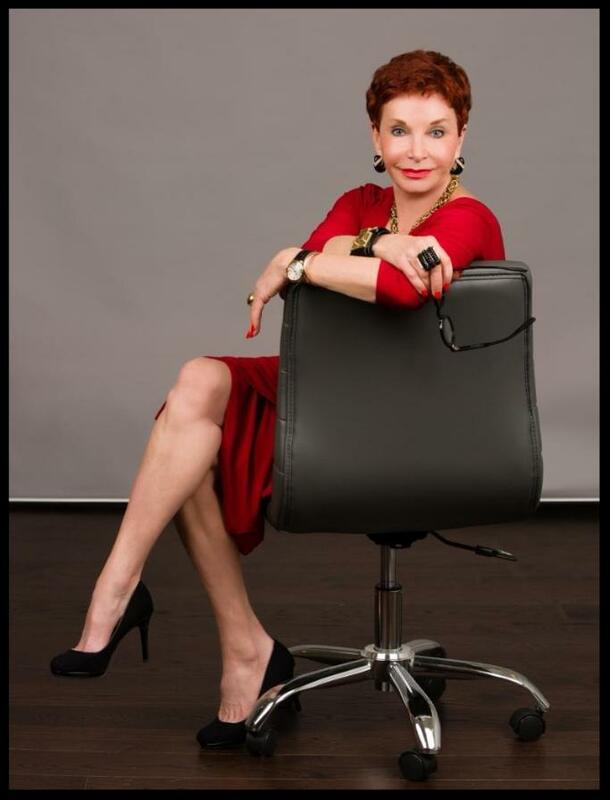 Sally Kimball, owner of Classic Collections and Classic Collections Gentry, has just opened the new office of Ambassador Realty Corporation, One City Plaza, 801 S. Olive Avenue, Suite 119, West Palm Beach, Florida 33401. Sally is proud to announce that Ambassador Realty Corp., which was established 24 years ago, has added many well-established sales agents to its roster and offers a full venue of real estate and business services including a curated list of referral companies and property specialists. 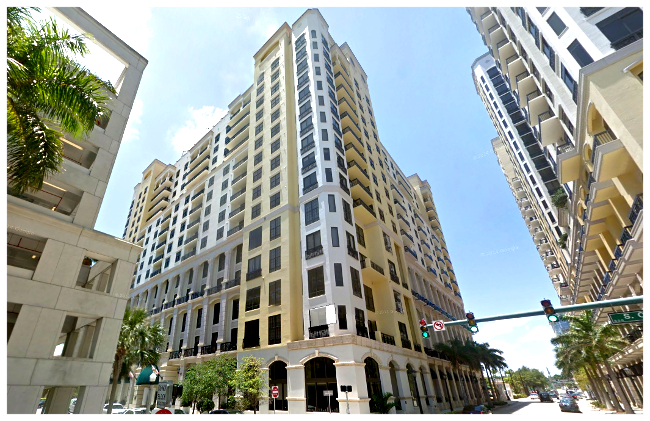 Specializing in Palm Beach Real Estate, West Palm Beach Houses and Downtown Condos, Waterfront and Golf Course Communities, Equestrian and Wellington properties as well as Commercial Real Estate and Business Brokerage, Ambassador Realty Corp. will be able to offer a wide variety of comprehensive services to clients from Miami up through Stuart. Please call Sally with all of your real estate needs on her mobile at (561) 373-6758 or at Ambassador Realty's Offices at (561) 557-7662. And come and visit-there is free valet at One City Plaza! Classic Collections would like to end with a most happy announcement! 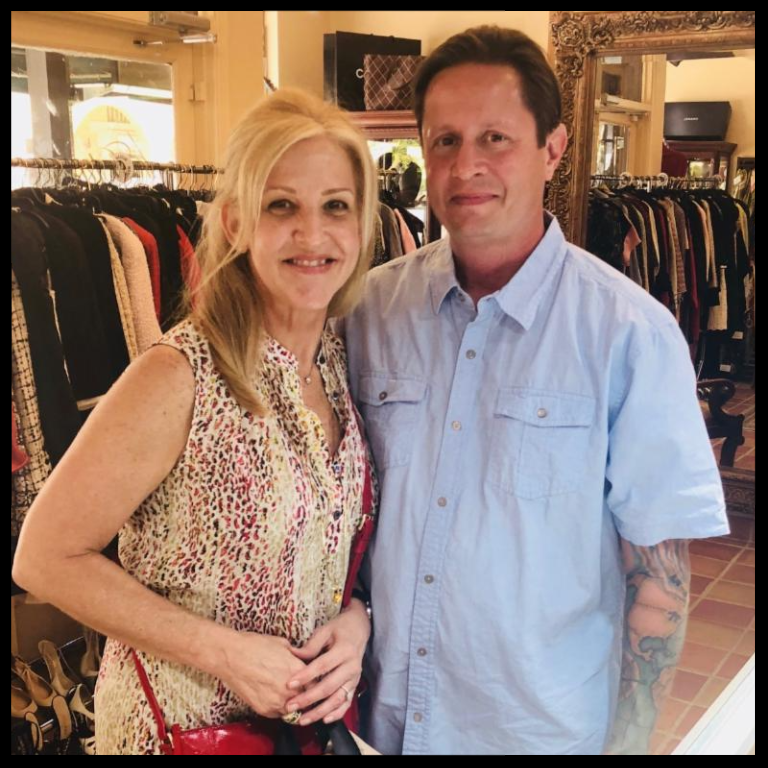 The future Dennis and Toni Hogan celebrated their commitment to each other with an engagement that was consummated at Classic Collections on Saturday, April 7th! The lovely Toni saw a beautiful diamond ring and tried it on and it fit just perfectly. Dennis said "do you really love it?" Toni replied that "yes, and it's been 8 years of being together!" No surprise, it was a done deal, the ring stayed on Toni's finger and with the staff cheering and crying with the happy couple an Engagement Was Made! We wish the soon to be newlyweds the absolute best the world has to offer and a Classically Collected wedding!